Leprosy can be associated with secondary antiphospholipid antibody syndrome (APLAS) with associated thrombotic manifestations, but the occurrence of ischemic stroke is very rare. We report a patient with Hansen neuropathy having Lucio phenomenon, APLAS, and ischemic stroke. A 38-year old gentleman presented with fever and nonhealing ulcers over both lateral malleolus, joint pain for 2 years, progressive distal weakness of upper and lower limbs, and weight loss for 6 months. On examination, he was pale, emaciated with erythematous bullae over the forearm, arms, legs and forehead, and swelling of the feet and right hand [Figure 1]a. He had a history of right hemiparesis with residual weakness (grade 3). His ulnar, peroneal, and dorsal branch of radial nerve and greater auricular nerves were thickened. He had a wrist and foot drop. Sensations of pinprick and temperature were reduced on the dorsum of right hand. Investigations revealed a low grade anemia, leucocytosis, as well as raised erythrocyte sedimentation rate (90 mm) and C-reactive protein (3.04 mg/dl). The serum chemistry was normal. Immunoglobulin (Ig) G and IgM antibodies for anticardiolipin antibody were positive with titers of 46 and 207, respectively, along with positive beta 2 glycoprotein-1 (beta 2gp-1), with persistent titers 2 years later as well. The antinuclear antibody, extractable nuclear antigen (ENA) screen, antineutophil cytoplasmic antibodies (ANCA), and rheumatoid factor (RF) were negative. Cranial magnetic resonance imaging (MRI) revealed a left capsular infarction [Figure 1]b. He was treated with acenocoumarol for 4 years and had no vascular events. Nerve conduction studies revealed evidence of mononeuritis multiplex. The split skin smear was positive for Mycobacterium leprae. Nerve biopsy of the dorsal ulnar nerve and the skin biopsy suggested the diagnosis of inflammatory neuropathy with the possibility of Hansen neuritis. The Wade Fite stain showed plenty of acid-fast bacilli suggestive of borderline lepromatous leprosy [Figure 1]c and [Figure 1]d. The patient was prescribed dapsone 100 mg, clofazimine 50 mg, and rifampicin 600 mg monthly along with prednisolone 30 mg and folic acid 5 mg daily. Within a week, his joint pains had subsided with improvement in the power of upper limb and lower limb muscles. Leprosy results in secondary APLAS in up to 89% of the patients. Leprosy is known to produce IgM anticardiolipin antibodies which can induce thrombotic changes by co-factor β2 glycosylphosphatidylinositol (GPI)-dependent mechanism. 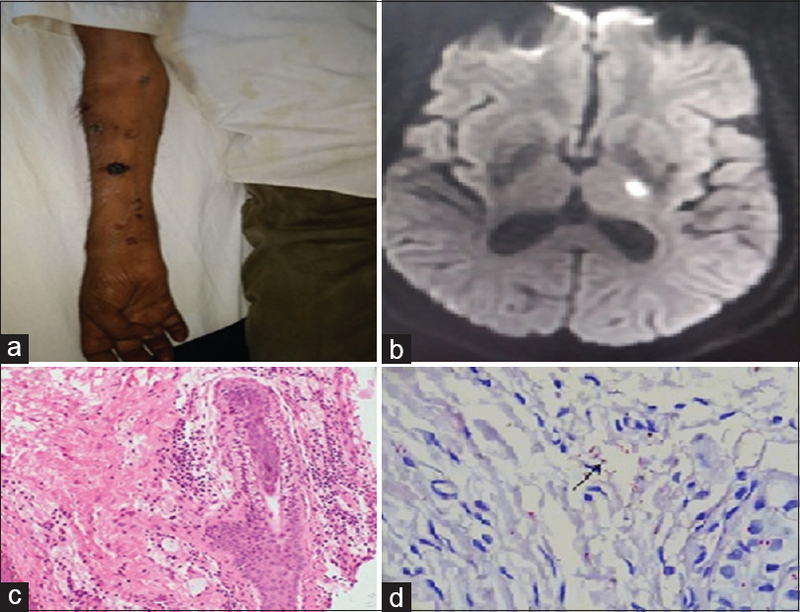 Lucio phenomenon may occur before, during, or after treatment of multibacillary or borderline leprosy. Its clinical features may simulate secondary systemic vasculitis. Symptoms of leprosy occurred 2 years following the diagnosis of APLAS. It may be due to the long incubation period of leprosy; and, leprosy bacilli may be present in the patient's body prior to the development of APLAS, which could have triggered the onset of APLAS. The authors certify that they have obtained all appropriate patient consent forms. In the form, the patient has given his consent for his images and other clinical information to be reported in the journal. The patients understand that their names and initials will not be published and due efforts will be made to conceal their identity. We thank Mr. Shakti Kumar for secretarial help. Loizou S, Singh S, Wypkema E, Asherson RA. Anticardiolipin, anti-beta(2)-glycoprotein I and antiprothrombin antibodies in black South African patients with infectious disease. Ann Rheum Dis 2003;62:1106-11. Ordi J, Selva A, Monegal F, Porcel JM, Martinez-Costa X, Vilardell M. Anticardiolipin antibodies and dependence of a serum cofactor. A mechanism of thrombosis. J Rheumatol 1993;20:1321-4. Misra DP, Parida JR, Chowdhury AC, Pani KC, Kumari N, Krishnani N, et al. Lepra reaction with lucio phenomenon mimicking cutaneous vasculitis. Case Reports Immunol 2014;2014:641989. Kaliyadan F, Bhaskaran M, Dharmaratnam AD, Manoj J, Sreekanth G. Anti-phospholipid syndrome preceding diagnosis of lepromatous leprosy. Dermatol Online J 2009;15:4.